Site Surveys (also known as soil surveys and ground/site investigations) are important to understand the likely ground and ground water conditions in order that appropriate foundations can be designed. Unforeseen ground conditions can pose serious problems to developments leading to re-design of foundations, time delays and increased costs. These risks can be reduced by a well planned phased site survey incorporating Phase 1 and Phase 2 site investigations. Our highly qualified team of consulting engineers can deliver services from basic assessment to advanced analysis, ensuring that we can support our clients in making the most sustainable choices that deliver the best value over the life cycle of a project. The presentation on this page shows the importance of undertaking a site investigation to correctly assess the risks to human health. 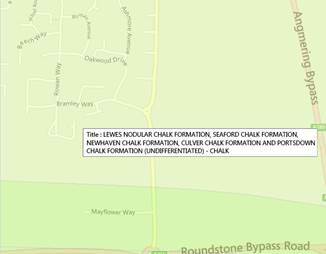 Unforeseen ground conditions pose a serious risk to developments. In order to mitigate this, best practice is to undertake a Phase 1 Investigation (Desk Study) the outputs of which comprise a preliminary environmental and geotechnical risk assessment and preliminary conceptual site model. These identify the potential risks associated with the site and receptors. This information is then used to inform the scope of any Phase 2 intrusive investigation. 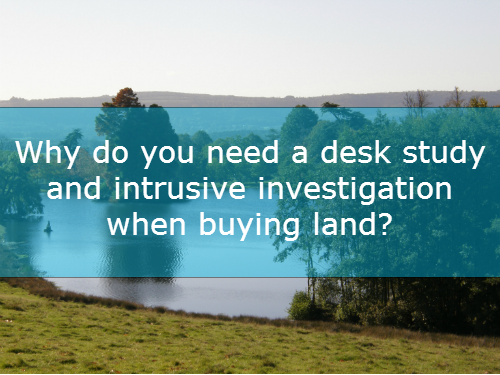 A desk study and intrusive investigation are quite often a planning requirement for a new development, though it is advised to undertake a Phase 1 for every development, and where necessary a Phase 2 intrusive investigation. 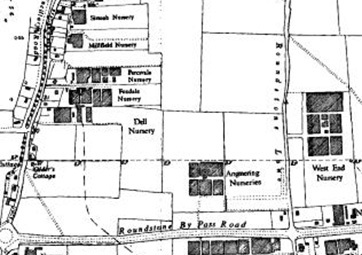 Geo-Environmental can provide a pre-construction risk assessment with a geotechnical and environmental desk study, including comprehensive sets of historical maps, searches of Environment Agency records and Local Authority databases and assessment of other relevant sources of geotechnical and environmental information, to identify any risks in your proposed development site. 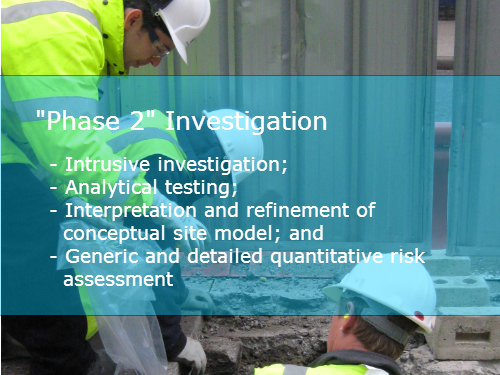 In order to fully characterise the levels of risk on a site it is necessary to undertake a site investigation so that the distribution, mobility and environment behavior to fate and transport of contaminants. In addition, the intrusive investigation can be used to obtain pertinent geotechnical information on the ground and groundwater conditions beneath the site to inform the design of foundations, pavements, soakaways, retaining walls and earthworks. 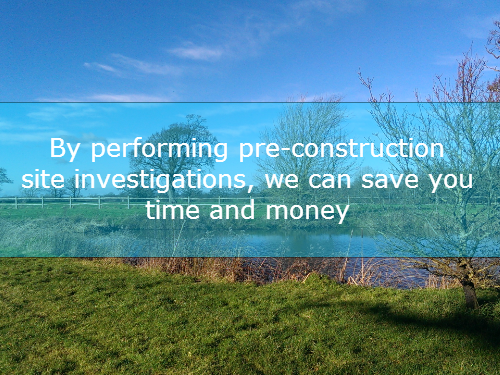 Geo-Environmental can put together an appropriately scoped investigation strategy utilising appropriate techniques which may include; rotary drilling, cable percussive drilling, window sampling, permeability tests, portable X-Ray fluorescence (PXRF), amongst others. All soils would be logged in accordance with BS5930 and relevant Eurocodes and in-situ testing and sampling will be undertaken in accordance with Eurocode 7, BS5930, BS1377, BRE Digest 365, or other specific guidance as relevant to the individual tests. 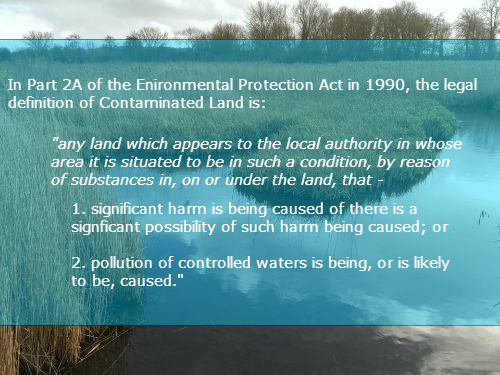 The geo-environmental aspects of the investigation would be undertaken in accordance with BS10175 and CLR11. Finally, we analyse the laboratory results and other data and produce an interpretive geotechnical and environmental site appraisal report or a full site investigation. This will include records of the encountered conditions, an assessment of geotechnical parameters in terms of the proposed construction, and an assessment of environmental issues pertaining to the site and its redevelopment. 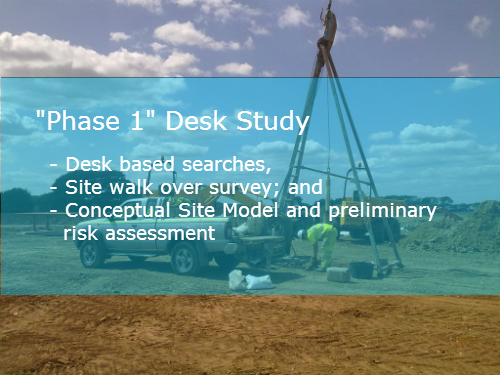 Based on the conceptual site model in the Phase 1 desk study, our consultants produce the investigation and assessment strategies that are used to determine likely geotechnical and geo-environmental constraints or issues on a site and from these, relevant sampling and testing regimes are undertaken by our site engineers. 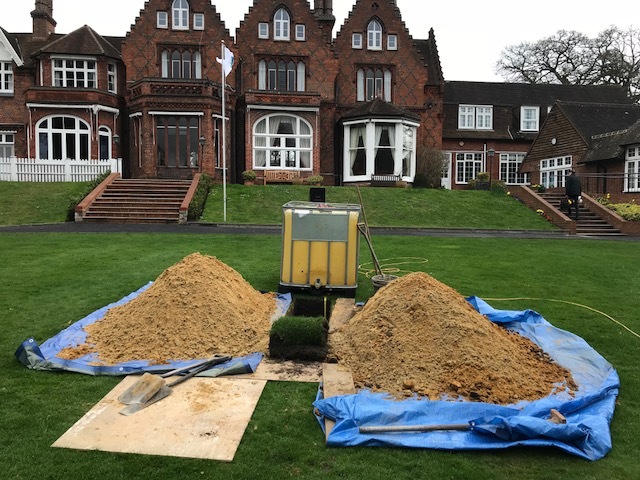 Geo-Environmental in partnership with K4 Soils Ltd can undertake geotechnical testing to BS 1377:1990, ISRM Suggested Methods, and non-standard tests to suit a client’s specific design requirements. 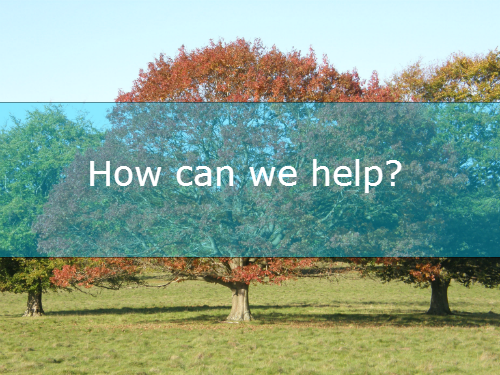 We can undertake environmental analysis in partnership with ELAB. Their services include air/gas, soil and water analysis, inorganics and organics analysis, chemical testing, metals analysis, as well as asbestos identification, waste characterisation testing and waste acceptance criteria (WAC). ELAB is accredited by UKAS to ISO 17025 for asbestos identification and for a range of soil and water tests. It also holds MCERTS accreditation for a range of soil tests. Our consultants undertake generic quantitative or detailed quantitative risk assessments with respect to human health and other sensitive receptors such as controlled waters”. For many living in houses in the UK, it is not possible to extend their property upwards and outwards. Increasingly home owners and developers are looking to build downwards, with basement developments becoming increasingly more popular. However, ground conditions and groundwater can have a real effect on the feasibility of any new basement development. 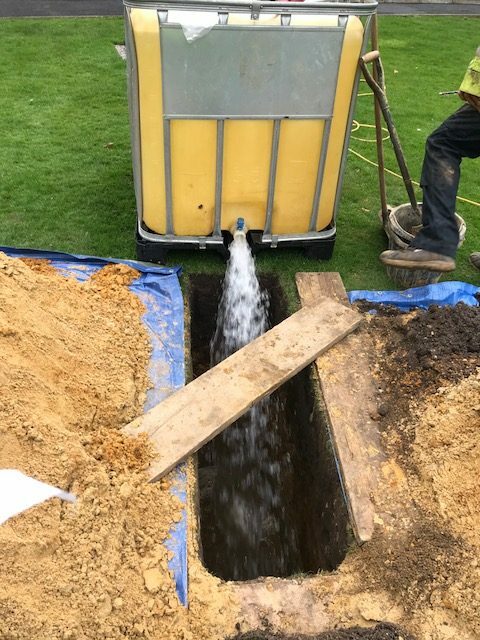 Any planning application for a new basement is likely to receive planning conditions which require the developer to demonstrate that the potential impacts on groundwater flows and ground stability have been addressed. Will it increase the likelihood of flooding to the property? Will it increase the likelihood of flooding for neighbouring properties? Will it affect water flows around the area, increasing risk of flooding in the area? Will it impact the local highway, rail, underground or other utilities? Will it affect any historic structures? Is the person providing advice appropriately qualified? Our basement impact assessment will comprise of a desk study of geotechnical and hydrogeological factors pertaining to the site, including a review of available borehole records and an examination of other available sources of geotechnical and hydrogeological information relevant to the site. For more information you can downlaod our Basement Impact Assessment brochure or you can contact us. Ground gas monitoring is undertaken to determine the potential risks and resultant gas protection measures required for new structures. Monitoring is undertaken for methane (CH4) etc. through gas flow within the borehole, which is dependent on the atmospheric pressure at the time the reading was taken. We would use either use a hand held device to store readings for later use, on a portable infra-red gas analyser, or we could install a GASCLAM, which would be left in-situ and enable continuous monitoring of the gas levels in a borehole. Water monitoring is used to either; monitor water levels using a dip meter, obtain water samples for testing by using a peristaltic pump or a hand held bailer. or to measure recharge time following the purging of a borehole. We can also monitor water level fluctuations over a length of time using a level logger. These would be left in-situ and would automatically log water level measurements at specific pre-set time intervals. 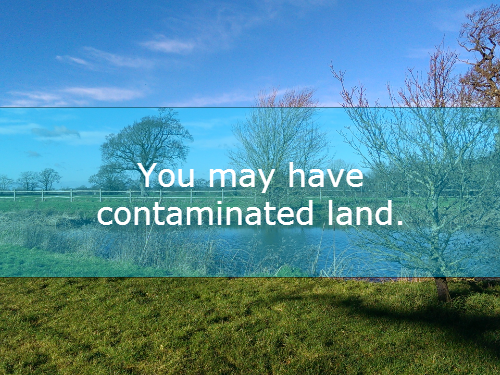 If remedial measures are required at a site in order to mitigate any risk associated with soil and groundwater contamination Geo-Environmental can provide a site specific Remediation Strategy and Verification Plan. GESL has a wide experience in Validation and Verification. CLR 11 defines verification as “the process of demonstrating that the risks have been reduced to meet remediation criteria and objectives based on a quantitative assessment of remediation performance”. CLR11 identifies four key stages in the verification process. 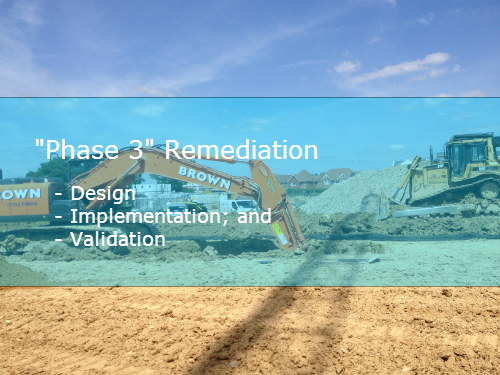 Developing the remediation strategy – planning verification is an integral part of this process and involves the review of information already available and collected during development of the remediation strategy. Developing the verification plan – including identification of the roles, responsibilities and sampling approach needed to demonstrate that remediation objectives are satisfied. Implementation of the verification plan, with production and communication of the verification report. Long-term monitoring and maintenance, where needed to satisfy long-term remediation objectives. 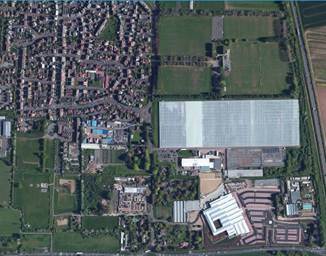 Geo-Environmental have staff who are appropriately experienced and qualified to provide a detailed site specific remediation strategy. 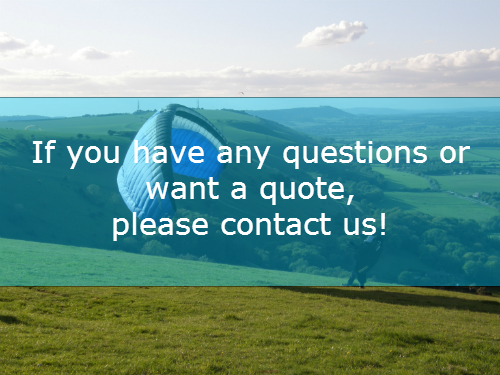 We have a wide experience in tailoring an appropriate remediation strategy for a range of developments and settings, either in the form of in-situ techniques or cover and containment. Geo-Environmental have relationships with a range of specialist remediation contractors who operate a range of in-situ and ex-situ techniques. We can oversee the process and ensure that upon completion of the remediation Geo-Environmental can produce a Verification Report in order to discharge the relevant planning condition. The verification report will provide documentary evidence that the remediation has been undertaken in accordance with the regulatory approved remediation strategy. The report will detail the works undertaken, contain records of inspections, photographic evidence of works, drawings detailing remediated areas and evidence that waste soil arisings have been disposed appropriately.